Good Riddance is a really great, easy guitar song that I love teaching to beginners, as its pretty simple to learn and play on the guitar, and it has a great melody. It starts off by learning a couple of basic guitar chords, arpeggiating them then strumming them in a pattern that resembles the initial arpeggiated rhythm. If you’re a beginner guitarist, this is a must learn song, as it’ll quickly develop several guitar skills, and you’ll have loads of fun in the process, since once you get the chord changes down, it’s a quick learn. Trust me, you’ll be playing this song for a long time, since even though it’s fairly simple, its energetic and just plain fun to play :-). 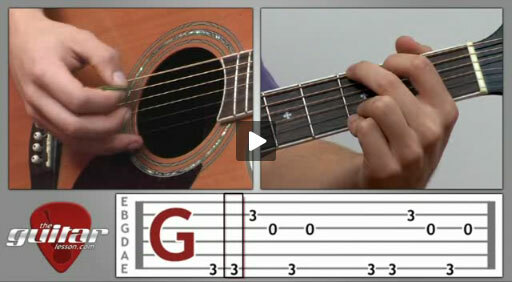 Out of all our beginner guitar lessons, Good Riddance is the one that absolute beginners love learning, you will too. Good Riddance was written in 1994, but not released until 1997 on Green Day’s third album, Nimrod. The song went on to the top of the charts in 1998. Good Riddance (also known as Time Of Your Life) This is not a typical Green Day song, as its meant for playing on the acoustic guitar (Green Day is more of a punk-rock band). Billie Joe, the lead singer of the band wrote this song after a break up, but despite that, it’s very energetic and often played at weddings and proms. The song starts off with a joke, a purposeful mistake followed by a bit of light cursing, which was meant to relieve the serious nature of the song. Sorry, but you've reached a premium content area. The download of the Good Riddance (Time of Your Life) tablature file is only available to premium members. Sorry, the same goes for the backing track. To download the backing track to Good Riddance (Time of Your Life), please log in and revisit this page.